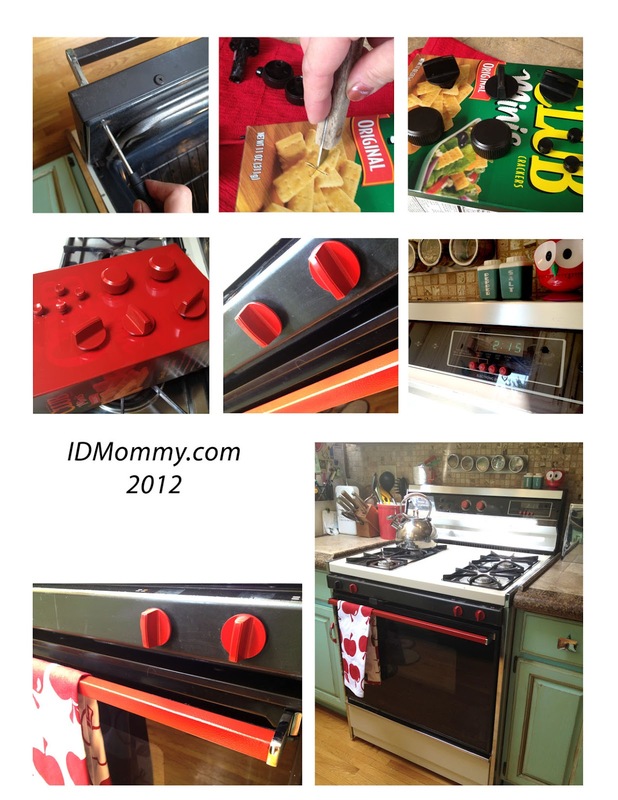 ID Mommy: Painting Appliances & My 1950's Style Kitchen Makeover! 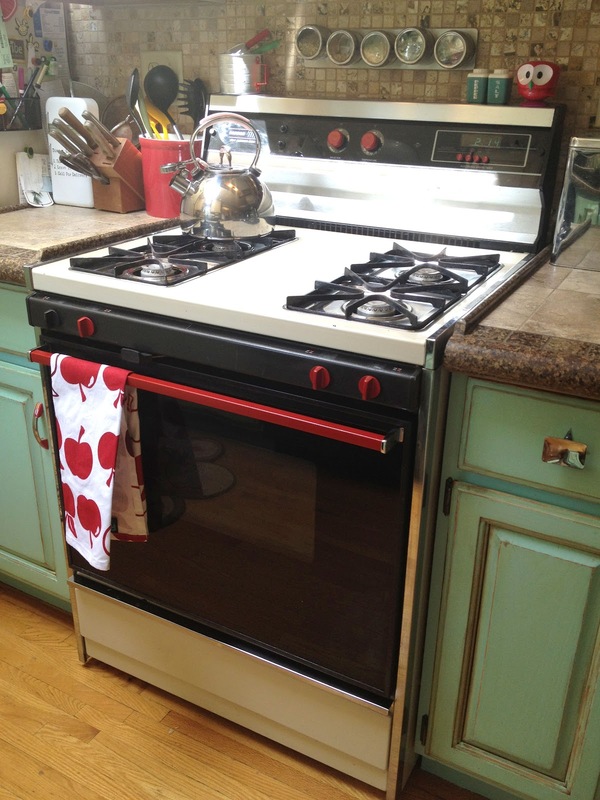 Painting Appliances & My 1950's Style Kitchen Makeover! So, you have already seen the whole process I followed to paint my 80's oak cabinets and give them a vintage 50's vibe. If not, click here to check it out. At the risk of boring you with photos of my kitchen, I'm doing this one last post just to share more specifically how I have achieved the whole 1950's style with accessories, and with a little spray paint to my appliances! The jade green idea was inspired by a ceramic sheep planter (below) that I have which used to belong to my Great Grandma Dorothy (below). It always sat in her front porch window, and as a little kid I remembered watching for that green sheep as we drove down her street and then being so proud of myself for being able to spot her house before Dad even started turning into the driveway. It was the only thing of hers that I wanted after she passed away, and I love having it in my kitchen window now! I didn't mention this in my cabinet painting post, but I also pulled off the quarter-round wood trim that sat at the top edge of my cabinets against the ceiling, and spray painted it chrome! From the distance it sits in the kitchen, it looks like metal trim. My next big kitchen dream, which would be the sprinkle on top of the cherry on top of the icing on top of the cake, would be to get some new appliances with retro styling like Big Chill. The funny thing is, I actually like how my old appliances look more now that the cabinets are painted than before...the bisque white matches well with the cabinet color and they blend away. So, I just did a little red accent spray painting which really makes them look custom for just a few bucks! I started with the toaster oven. I found several cool, retro looking red toaster ovens on Amazon, however, the KitchenAid one we already have is way nicer. I didn't want to downgrade just to get the color red. So, I painted it! I took a trip to my local auto parts store and picked up a can of Rustoleum Engine paint. 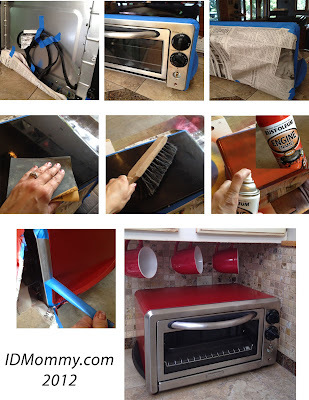 I got engine paint because it's designed to withstand temperatures of up to 500 degrees, and the toaster oven does get hot. You can also find "high heat" paint at the hardware store, but I couldn't find any in red. First, coil up and tape down your cord, then tape off the most important edges. I just wanted to paint over the black metal, so that's what I taped around. Then use newspaper with more tape to cover up the larger surfaces. Everything should be covered except what you want painted. Lightly sand the surface if it's slick like mine, to take off some of the gloss. Remove the dust, and spray it! Once you've achieved the finish you like and it's all dry, remove the tape and marvel at your "new" toaster. 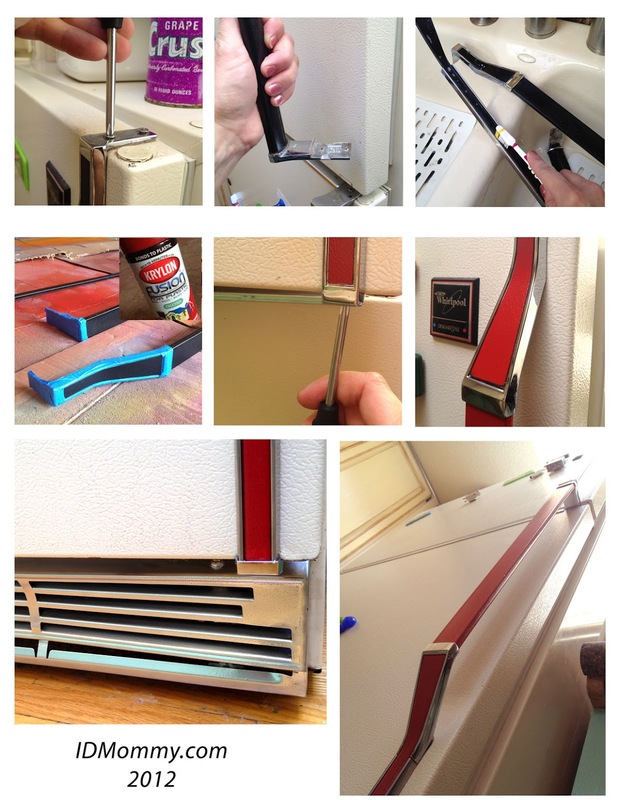 Did you know that you can remove your fridge handles? Heck, you can swap the handles and hinges to make it open the other direction if you want. They are designed that way. 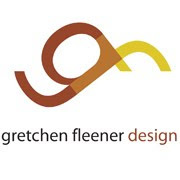 I know this with certainty, being an industrial designer who has had experience both in designing refrigerators and designing the retail environment they sell in. Just a few simple screws will pop them all off. Tape off the parts you don't want painted as before, and go to town. Since the part I'm painting on my handles are made of a thin vinyl veneer, I chose to use Kryolan Fusion spray paint, which is designed to adhere best to plastics. It worked great and was also perfect for the plastic knobs on the oven. 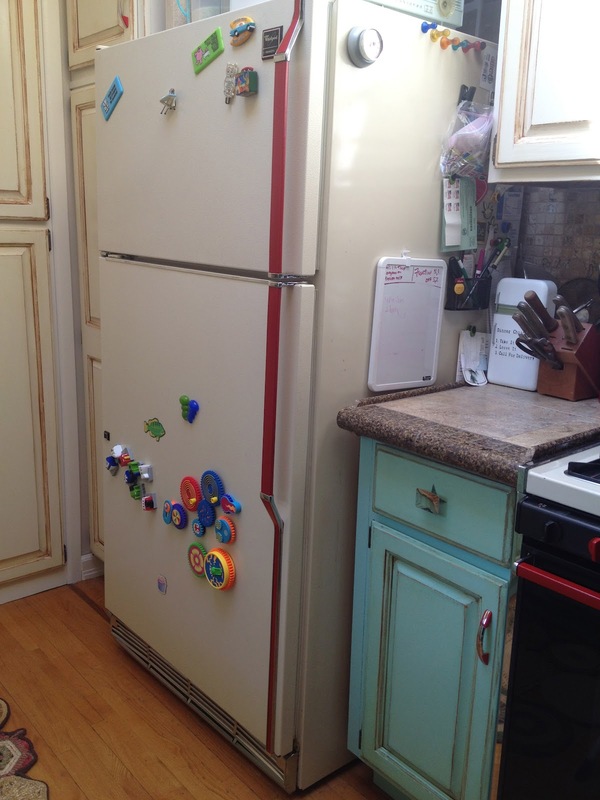 The fridge, complete with red handles and chrome grill! Now for the oven...the handle removed easily, again, with just two bolts. I grabbed an empty Club cracker box out of my recycling bin and used a knife to cut "x's" in the side, then was able to pop my knobs right through the box. It made it so easy to move the knobs around to paint and keep them from rolling around sticking to things. The handle was the same process as the fridge...tape off the chrome and paint away! The oven, done! Except that one stubborn knob on the left...can't for the life of me get that one off! I'm gonna have to see if my hubby can get it to budge tonight when he gets home. Found the cute apple towel at Target on clearance this week for $1.50. So, that's how I gave my appliances a retro facelift. Here are some of the other fun, random accessories that I have collected over the summer...they all finally look like they belong here now! I got some suh-WEET knobs for the drawers (above/below) at a place called Art and Architecture in Minneapolis, thanks to my fab sister who took me there and dug through oodles of dusty old stuff to pick them all out with me. My window box, full of fun vintage 1950's planters, vases, and the green sheep that inspired it all! 1950's General Electric pink wall clock, $2 at an estate sale. I had to put a plug on the cord and happily, it worked! Vintage Lincoln Beautyware canister set, came with the wrap organizer below, $8 at an estate sale for the whole set. Dispenser for tin foil, wax paper, and paper towels (came with canister set above) I found some 3M Command hooks at Home Depot that were basically like metal nail heads, so I could stick those to the tile and then hook this holder to those via their keyhole hooks. Slick! No holes needed in the tile. Found this cool metal "meat storage" drawer from an old fridge for $0.25 cents at a garage sale! It sits on top our frig to hold bags of chips and other opened snacks. 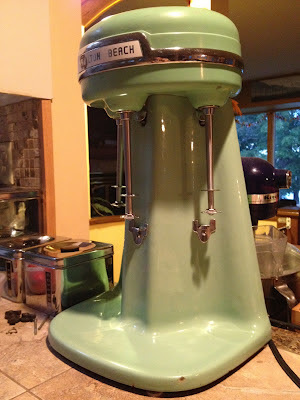 Vintage Hamilton Beach industrial size triple malt mixer found at a garage sale! I took it all apart to clean it, but the cord is too frayed to plug it in. Just got a replacement cord at the hardware store and I'm hoping to get it running tonight! Overall I just LOVE how it all turned out. And I have to admit that I'm just a tad proud of myself for doing every single last bit of the work painting the cabinets and appliances by myself. I know that's probably not very 1950's housewife-ish of me, but that's okay. I think I'll go put on my frilly pink apron and do some more canning now! I just found this post when I was googling painted appliance handles. 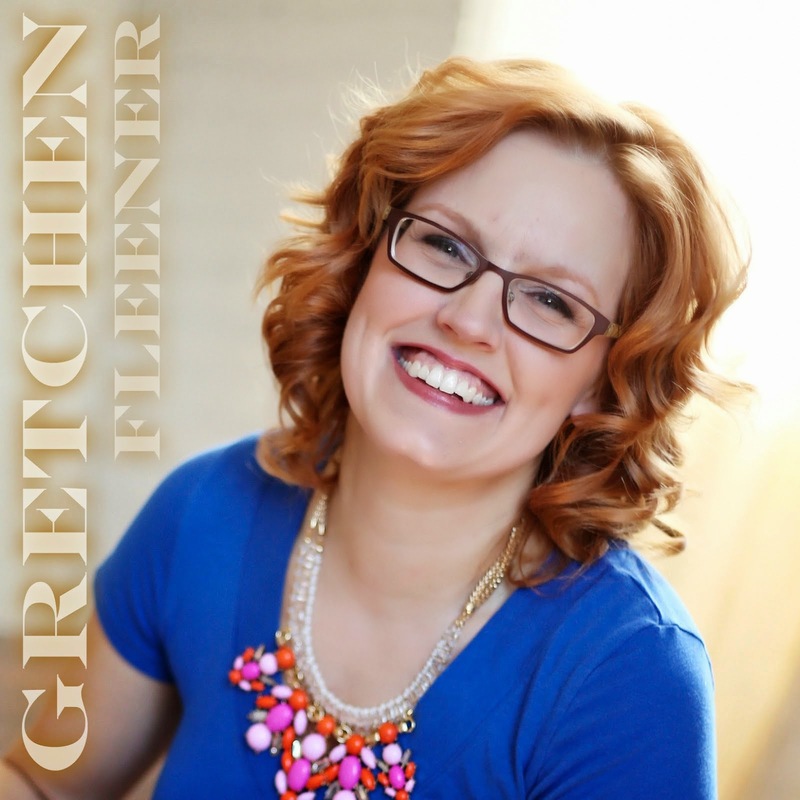 Your appliances look great! How well has the paint held up? I would like to paint my handles chrome, but I am concerned about it being easily scratched. 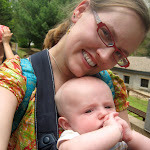 We have 3 kids, and none of us is particularly careful. My First Canning Attempt: Canned Salsa!